Range in size from 10" to over 30". Average sizes are 16" to 24", with fish between 26" and 28" common. 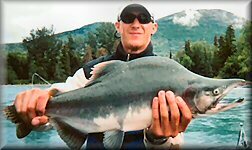 Kenai fish can be very heavy, with 28" fish often exceeding 10lbs, and 34" fish likely exceeding 20lbs. Larger fish are more frequent later in the season, but trophy sized rainbows are available all the time. The exceptionally large fish are very challenging to land. The longest released by one of our guests was 36". We love rainbows! What the heck are they? They are Char. In fishing terms, they are like trout. Dollies are the western version of the Brook Trout. While Kenai rainbows tend to get larger, we regularly see Dollies from 18-24" with larger fish common. Mature Dolly Varden are brilliantly colored during the fall season. Dollies are migratory and the Kenai features both resident and anadromous populations exibiting a variety of colorations and body characteristics. The longest released by one of our guests was 32". Available all year. SOCKEYE (RED) SALMON (Limits typically from 3-6 per day) There are multiple runs of Sockeye that we fish. The early (first run) Reds are bound for the Russian River. We catch them in the Kenai River when the season opens on June 11 and continuing for about 3 weeks. Eventually, they all move up the Russian Russian River to their spawning areas. There is usually a gap of about two weeks between runs, but groups of fish are always moving through the system. 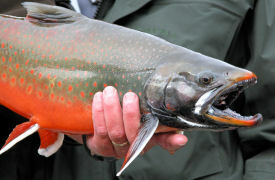 The late (second run) Reds spawn in both tributaries and the main stem Kenai River. They run from mid July-mid August and are spawning in the mainstem Kenai into October. Sockeye are silver when they arrive from the ocean (good to eat) and then transform to red (not good to eat) as they near spawning. They typically range from 4-12lbs with the average running about 8lbs. We have weighed them up to 15.5lbs. There are both tributary and mainstem spawning runs of silvers. 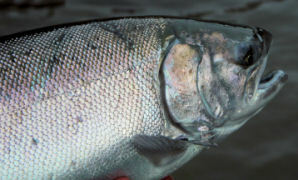 The first fish are tributary bound and arrive amid the sockeye in late July. The later fish spawn in the mainstem from October to March. We typically target silvers from mid August to the end of our season. They range from 6-20lbs with the average size being about 10lbs and the larger fish arriving later in the fall. 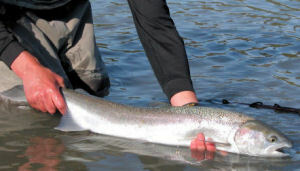 Silvers are a great fish to catch on the fly and at times they can be easily tempted to take streamers. There are two runs of kings (tributary and mainstem), but for fishing purposes, they are available from mid May-July 31. There may be an extension into the first week of August, but it will not be announced until the last week of July. Kings range from 10-90lbs, with Kenai averages of 30-45lbs and Kasilof averages of 15-25lbs. The Kenai River was put on the map as a King Salmon destination. Most of the angling for Kings takes place on the Lower 21 river miles. The primary techniques are backtrolling and side drifting from power and/or drift boats. Fly fishing the Kenai for Kings is challenging, but possible under the right conditions. While Pink Salmon are not known as a favored angling species, they can provide fast action. They are often hooked incidentally while fishing for Silver Salmon. Pinks provide lots of action when encountered early on their run and can be fun for kids and anglers looking for steady bites. Pinks primarily run every other year (even numbers) in the Kenai. They are not counted, but arrive in numbers exceeding several million. They are available from late July-mid September and spawn throughout the Lower Kenai River below Skilak Lake. STEELHEAD (Catch and Release Only) While not known as a steelhead producer, the Kenai River does draw in some steelhead. Some fish taken on the lowest river reaches are likely strays, just testing the water. Upstream, we have taken steelhead in the fall (fall run fish) and in the spring (post spawn). Many are in the 26 to 32" range like the fish common to the smaller peninsula streams. We have seen a few between 34 and 36".